Trump Says Qatar Funds Terror. Here’s His Record Of Trying To Get It To Fund Him. The president is allying himself with those blockading the tiny country, but he’s made attempts to secure Qatari investments in the past. 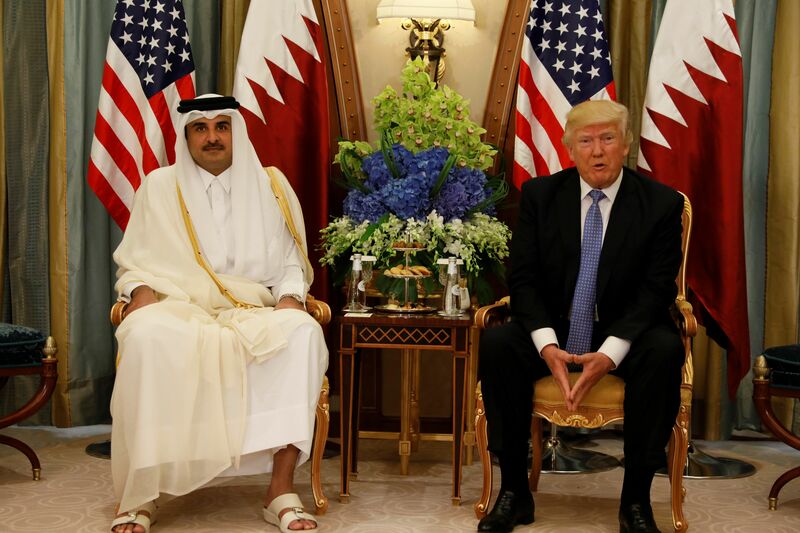 Qatar’s Emir Sheikh Tamim Bin Hamad Al-Thani meets with U.S. President Donald Trump in Riyadh, Saudi Arabia, May 21, 2017. Donald Trump, his daughter Ivanka Trump and her husband Jared Kushner all repeatedly sought financing for various investments in recent years from leading figures in Qatar, according to sources with direct knowledge of the meetings. Those previously unreported overtures have taken on new relevance as a diplomatic crisis aggravated by President Trump has left the small Gulf nation blockaded and isolated by its rivals, with tensions in the Middle East reaching historic highs. That partnership is not merely rhetorical. Qatar is home to Al-Udeid air base, the regional Central Command headquarters from which American bombers depart on daily missions against ISIS and al Qaeda. Reacting to the GCC dispute, the Defense Department praised Qatar’s commitment to fighting ISIS as its secretary, James Mattis, expressed his confidence that the turmoil would not interrupt Qatar’s contribution to those efforts. Given the weave of interests and close cooperation between the U.S. and Qatar, many are seeking ways to interpret Trump’s abrupt turn against Qatar in the dispute. Some think the answer lies not in the realm of policy but in the history of Trump’s business deals with the various actors in the dispute. Saudi Arabia — and I get along great with all of them. They buy apartments from me. They spend $40 million, $50 million. Am I supposed to dislike them? I like them very much. Therein lies the source of much consternation among Qataris. Several people interviewed for this piece expressed concern that Trump’s bias against their country might stem from a series of failed business overtures that he (along with his son-in-law Jared Kushner) made seven years ago, which are only now being reported. They did not go as swimmingly as the deals made with the Saudis and Emiratis. Traveling with his daughter Ivanka, Trump visited Doha in 2010 for separate meetings with Qatar Investment Authority (QIA) executive board member Dr. Hussain Al-Abdullah and as well as Sheikh Hamad bin Jassim al-Thani (commonly abbreviated as “HBJ”), who was then serving as foreign minister and prime minister. Neither responded to requests for comment on this article. At the time, the pair constituted the brain trust of Qatar’s financial and investment sector. QIA is the world’s second largest sovereign wealth fund (presently estimated at having $338 billion in assets under management). Then as now, Sheikh HBJ had renown for being kingmaker of not just political deals but financial ones too. Using his business and political savvy, he has sealed deals ranging from Britain’s Harrods to Germany’s Deutsch Bank to America’s Miramax Hollywood studios. A source close to the 2010 talks with Trump say he made the Doha stopover (along with stops in Dubai and Abu Dhabi) to raise money for a distressed real estate fund he was assembling. Trump opened the discussion with QIA by bragging about the success of Trump International and the many deals he had personally put together. Trump had hardly got through his own biography when Dr. Al-Abdullah, QIA’s senior executive, interrupted to say words to the effect of: We know who you are and what you have done. Tell us what you can do for us right now. That single, curt interruption apparently left Trump stunned. He had expected his hosts to be impressed, if not grateful, that a person of Trump’s stature would visit the Qatari capital. Apparently distracted by the lack of decorum, Trump barely continued with his pitch. The meeting abruptly ended, according to one account, with Trump exiting the room visibly angered. According to another, the meeting ended pleasantly and the decision not to invest in Trump was simply about Trump’s lack of track record in doing real estate funds. The same source also said any coldness to Trump was more a function of Dr. Al-Abdullah’s becoming numb to the same repetitive proposals—QIA routinely received such pitches. In the Qataris view, if not Trump’s, all that distinguished his proposal from so many others was his own celebrity status. A subsequent meeting that day between Trump and Sheikh HBJ ended with pleasantries but with the top Qatari businessman keeping hold of his wallet. Trump was unable to move any Qatari funds to the Trump Organization, and within months after leaving, observers noted that even Trump himself quit the distressed real estate fund idea, having failed to get a single backer anywhere. The Trump family interactions with Qatar expanded as Ivanka Trump returned to Doha within several months with her husband Jared Kushner, a wealthy real estate and media investor in his own right. Jared had a new pitch to make, this time on a different real estate deal. Ironically, some of Jared’s introductions within Qatar were facilitated by a national of the country that is a key player in the present crisis: Saudi Arabia. Through a personal friendship with Saudi Prince Bandar bin Sultan’s son Khalid, (who knew Jared and who remained in the U.S. after his father’s legendary tenure as ambassador ended in 2005) Jared gained entry to a younger cadre of successful Qatari businessmen during his trip. The Kushner Companies bought the building in January 2007, closing the deal on Jared Kushner’s birthday and paying the highest price ever for a New York office building. “This is a great acquisition for our company,” Jared Kushner said at the time. According to the Kushners, they put $500 million into the purchase. The luxury high-rise has been plagued by massive debt ever since—insiders say the Kushner family overpaid—which offers one explanation for why they have turned to foreign sources to help bail it out. Discussions to buy a stake in 666 Fifth Avenue between Jared and Sheikh HBJ—who left government in 2013 to pursue his own vast business interests—are said by a source with knowledge of the talks to have continued right up until the election of 2016. But the hunt for capital continued after Jared ended his pursuit of Qatari investors last year. In March 2017, Bloomberg reported that Kushner Companies was close to securing “unusually favorable terms” in talks with the Angbang Insurance Company, despite its ties to the “highest echelons of China’s Communist Party.” On the same day, Trump attacked Qatar as a financier of terrorism, lawyers from his Justice Department offered an advisory opinion arguing that as president he could accept payments from foreign governments after all, which would presumably include countries like Qatar and China. Today, with Trump allying himself and the United States with those blockading their tiny country, Qataris can’t help but wonder: is this all about Trump’s hurt feelings over business deals that didn’t pan out? For years America preached that the Arab countries should fight corruption and have financial transparency. Yet neither the American public much less most foreign countries dealing with Trump have any true understanding about the nature and volume of Trump family investments abroad whether in Saudi Arabia the UAE or elsewhere. For example, journalistic exposure of Jared’s family history of investing in illegal West Bank settlements provide Palestinians and the international community insights to his obvious personal conflicts, even if in Trump’s eyes that still makes him a suitable mediator of the Arab-Israeli conflict. So too with Qatar, it is necessary for Trump and his family to declare all their Mideast interests and holdings. This will enable others to form a view as to whether Trump’s recent weighing in on the side of Saudi Arabia and the UAE is a genuine attempt to perform the statesman role, or merely payback for business deals that never happened. Many Qataris suspect that they know the answer and are distressed by it. Could anyone have imagined that five or ten years ago, when businessmen turned down a New York mogul and reality TV host auditioning for its investment, that they were jeopardizing the security of their country? Not to mention America’s security interests in the Middle East. Clayton Swisher is an investigative journalist and author of two books on the Arab-Israeli conflict. He can be reached via Twitter @claytonswisher. The views represented in this article are the author’s alone. This entry was posted in National Security, Russian connection, Trump and tagged Qatar. Bookmark the permalink.